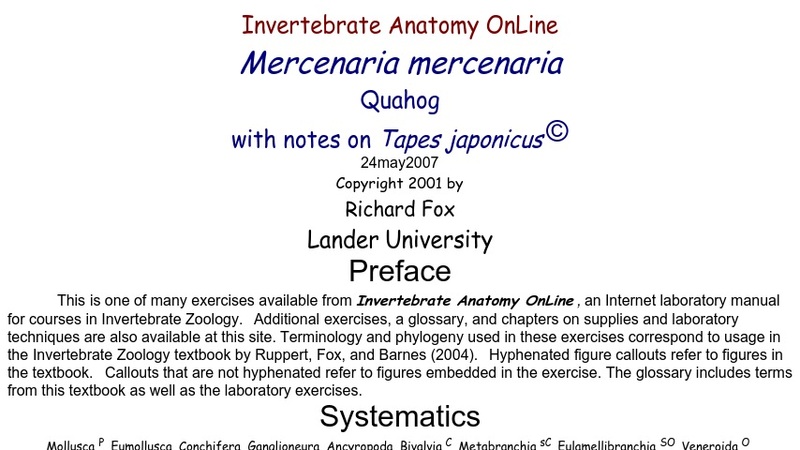 This Invertebrate Anatomy Online exercise, featuring the hard-shell clam Mercenaria mercenaria (quahog), is part of an Internet laboratory manual for courses in Invertebrate Zoology. This exercise features an introduction to Mollusca and a step-by-step dissection guide, including hand-drawn figures, defined terms, and detailed explanations of form and function. Students will learn about the external anatomy (shell), muscles, mantle skirts, mantle cavity, mantle folds, siphons, gills, labial palps, hemal system, exhalant chamber, excretory system, digestive system, nervous system, and reproductive system.